Crestron has launched Pixel Perfect Processing, an exclusive new technology to supersede the JPEG 2000 codec in its NVX family of AV-over-IP devices. Ahead of the official release, Crestron invited members of the press to its Rockleigh, NJ headquarters to look behind the curtain of this next-generation DM NVX solution. Motion video might have looked outstanding, but the JPEG 2000 (J2K) codec fell short as soon as spreadsheets or other highly detailed static images were viewed over the network at 4K60, 4:4:4, rendering them nearly useless. Eighteen months after the launch of DM NVX, 4K devices, displays, and content are more commonplace. “We wanted to make sure we accounted for this,” Peras said. “We worked extremely close with our original J2K partner, intoPIX, to develop Pixel Perfect Processing, a new technology which is exclusive to Crestron Electronics.” As of February 1, 2019, all DM NVX’s will be shipping with Pixel Perfect Processing technology. Committed to the DM NVX platform, Crestron has made upgrading to Pixel Perfect Processing a free firmware update for the 120,000 units already deployed. To demonstrate the new technology, Crestron placed two 4K displays side by side and fed them identical spreadsheet content (and a static photograph)—with one connected directly to a PC and the other receiving content through the DM NVX with Pixel Perfect Processing. When tasked with discerning which was which, the differences were visually imperceptible. Fine type within the cells of the spreadsheet were sharp. Even red type on various colored backgrounds, which would normally produce artifacts with J2K, was sharp. Further, upon testing the motion of mouse cursors on both displays, there was no discernable latency added by the DM NVX. The DM NVX delivers 4K60, 4:4:4, and HDR video over existing 1Gb infrastructure. “What we see is today is that 75 percent of Ethernet ports shipping are 1Gb, and only 4 percent are 10Gb,” said Nic Milani, director, commercial product marketing at Crestron. The DM NVX works on 1Gb and 10Gb networks. Currently, Peras said that switch manufacturers are making a significant investment into 2.5 and 5Gb wireless access points. “While they continue to develop their infrastructure and their products, we're going to continue to develop our products to make sure we can work with them as they deliver on their roadmap to 2020,” he added. 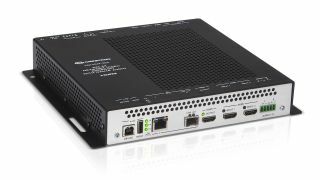 Crestron’s new DM-NVX-E30 and DM-NVX-D30 are encode or decode-only units that support HDMI connectivity and analog audio, delivering additional flexibility for basic endpoints when only video, audio, and control are needed. The DM-NVX-352 with Dante audio networking and AES-67 audio is also now shipping.